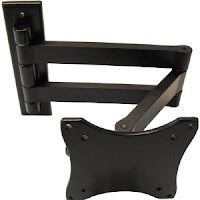 LCD Monitor TV Bracket Wall Mount with Swivel and Tilt. To ensure this bracket fits your monitor or TV, simply measure the distance between the mounting holes on the rear of your screen. If they are 75mm or 100mm apart, your screen is up to 24" wide and up to 15kgs in weight then this will fit you model. Adaptor plate for 100x200mm and 200x200mm mountings available in our other listings. *You must ensure the fixings and wall structure are appropriate to support the overall weight. I fitted it a couple of weeks ago and it's been absolutely fine and does just what I expected. Because it has an arm that is jointed in the middle it allows the TV to extend further and also swivel through 90 degrees. 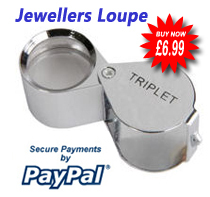 It seems well made and appears to be as good as other brackets costing several times more. I would have liked it to available in silver to match the TV but it's not really an issue as it's hardly seen anyway. As there is no adjustment to rotate the TV you do have to ensure that the mounting holes are truly vertical. I drilled and screwed the top one, mounted the TV, checked the screen was horizontal with a spirit level and then marked the position of the bottom hole before drilling it. What better gift for someone who likes to watch the T.V.